250 Sportster Frame Plans! New! 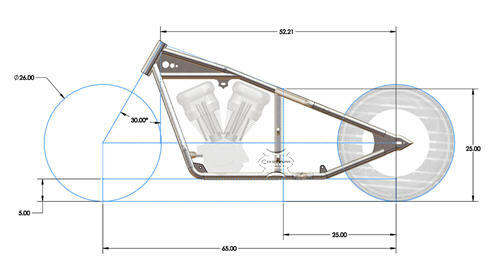 Our new 250 Sportster frame plans were professionally created, researched, and checked thoroughly for accuracy. These plans are unique because they provide sectional views that make it much easier to build. The reason that sectional views are important is because you can see how it looks when it is cut on a specific plane. This gives you a huge advantage over any other plans on the market because it's the only way to specify compound bends and angles. All the other plans on the market provide only horizontal and vertical dimensions with many different views. As a result these sort of plans are hard to understand, are very cluttered, and are often created by an amateur. 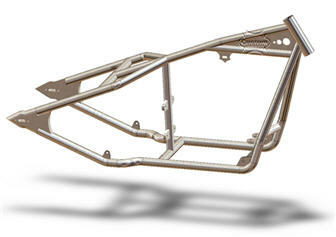 Get a professionally drawn set of Rigid 250 Sportster Frame Plans from a professional vendor. 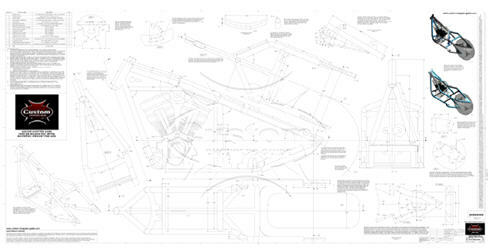 The 250 Sporster frame plans are on 36" x 72" paper. Here's A Basic Idea Of What Your Bike Will Look Like With Basic Measurements.